Spring is finally here, and we all know what that means: allergies, the flu, and head colds. This maintenance season, you should talk to us about our indoor air quality products and home air purification systems! At Reliant Air Conditioning, we offer so much more than just AC or heating options. In addition to just heating or cooling your home, there are other factors that come into play. 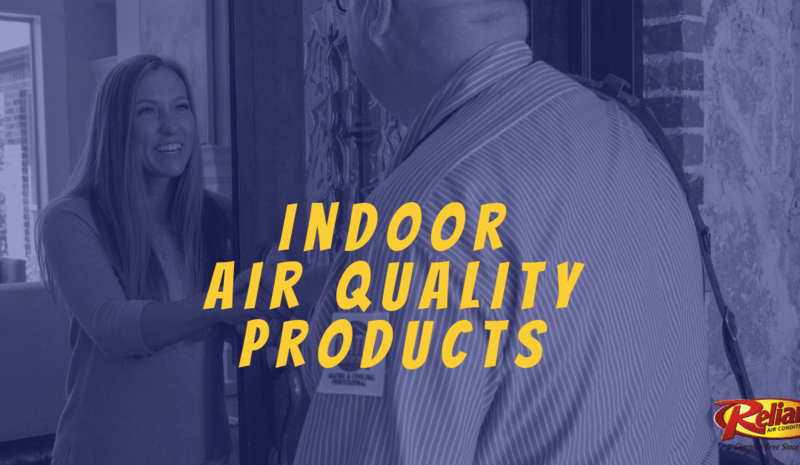 We offer a wide variety of indoor air quality products. Also, If you suffer from allergies or have a lot of people in your home that are constantly bringing in different viruses or bacteria that can be picked up from school or daycare – we offer some products that can really enhance the environment in your home. We carry whole-house air purifiers that can capture and eliminate any impurities from your air to help keep you and your family from getting sick. We can also install humidifiers and dehumidifiers. The humidity level in your home is critical to your comfort! Keeping the right amount of humidity in your home is really crucial. Our products are the best. They’re top of the line, and our professional team is trained in the installation and maintenance of each type of system that we carry. Ask a technician or call us to start the process to get your family new and improved air! The air quality in your home can directly affect your health. Don’t wait until it’s too late! At Reliant Air Conditioning, we truly believe that our company is the best to service or replace your heating or air conditioning system. If you find yourself in need of an AC repair or replacement this summer, contact us. We’re the company for AC repair DFW chooses time and time again! So call two other companies, then give us a call. You’ll be glad you did.